Aeon of Strife pits four human players and a weak AI against a significantly stronger AI. The game introduced a number of features which are still staples of the genre years later, such as the healing pad (fountain), lanes, and hero units which become stronger as the game progresses. The lane troops consist of six different units. The same units are used by both teams, but the enemy AI spawns more of them. Zealot: The basic melee minion. There are a lot of these; they form the front lines, and have modest health with low damage. Firebat: A stronger melee minion. Plenty to go around, modest health, and good damage which hits in a cone. Ultralisk: The strongest melee minion. Only one spawns on each lane every 1-2 minutes. Excellent health and armour with high damage, but bulky and has difficulty manoeuvring among the sea of smaller units. Ghosts/Marines: Both are ranged units. They spawn at a slower pace than the melee units, but will accumulate over time, since nothing will attack them while there's still melee units in front. They have low health, but output good damage. Hydralisk: Rare but powerful ranged unit. Has high health and armour, with great damage. These are by far the most dangerous, and the enemy AI's higher quantity of them is part of what makes winning so difficult. It's worth noting that armour in Starcraft works as a flat reduction, unlike Warcraft and subsequent lane-pushing games where it's a percentage. If a unit has 10 armour in Starcraft, they take 10 less damage from all attacks, to a minimum of 1 damage. This means that Hydralisks and Ultralisks with their high armour are impervious to almost anything except each-other and the hero units. Left alone, they will plow through the human players' forces until there's nothing left. I refer to these two as Elite troops due to their superiority. The map is littered with defensive instalments like bunkers, siege-mode tanks, and stationary units. None of these will respawn when killed; they are an early equivalent to towers. Thanks to their high density, their absence in an area of the map marks exactly how far the enemy has managed to advance in a particular lane. The sheer number of units in the game means that despite waves spawning periodically, there is never a moment where troops have run out of enemies to attack and are simply marching forward. The front lines are always a bitter fight, which keeps the action constant as well. Pushing too far into the enemy AI's base can be met with an Ambush: a huge wave of AI units spawning at once to counteract the advance. This usually comprises a lot of elite troops. The game ends when the humans lose one of their primary buildings, the humans run out of time, or the AI's primary buildings are destroyed. Many more games eventually emerged where heroes face off against masses of AI. The general term for these is a hero defence, though my name for games which stick close to the original AoS formula is "Lane-Pushing Survival". Running around on the top lane. 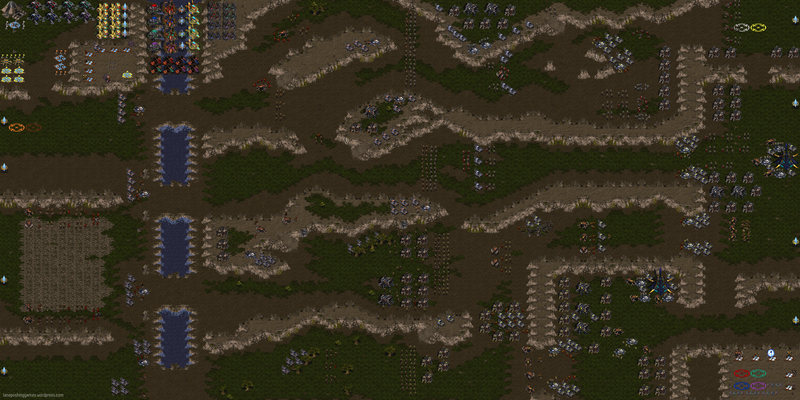 Due to limitations in the Starcraft editor, map-makers can only change a small subset of each unit's attributes, such as life or damage. Other values like movement speed, regeneration, damage type, and attack rate are all hard-coded. To provide a good variety of characteristics, the hero units in AoS had to be carefully selected from the available unit templates. Zergling: Has a great movement speed and is small enough to weave in and out of the masses of troops. It hits fast with an attack type which deals full damage to everything, but its base damage is the lowest of the hero units. Despite having the highest life of any hero unit, its "small unit" classification makes it particularly vulnerable to ghosts and marines. Conversely, it takes the least damage from tanks. Sometimes its burrow ability is handy to escape. Vulture: This grenade-launching hover-bike is the fastest unit in the game, has good range, and the highest damage and damage upgrade. However, it also has the lowest life, and its concussive damage type means that its high damage is only useful against the weaker units. That said, killing weaker units is how to make money, so the Vulture is a very fast farmer, and can still pull its weight. Goliath: This mech has good range, life, and damage, and is effective against all units, but benefits less from his damage upgrade to compensate. Dragoon: Great against large units like tanks, ultralisks, and buildings due to its explosive damage type. Unfortunately, it's weak against the rest of the cannon fodder, which makes farming difficult. Archon: Short-ranged unit with partial splash damage, which is great for clearing up masses of weak units, particularly if he can reach the enemy back lines. His damage type lets him deal full damage to everything, but he has relatively low base damage. Ultralisk: Probably the worst hero unit, due to his bulk making it difficult to get around. It has good life and damage though. So as we can see, a large part of the distinction between heroes is due to damage type and size classification. These determine what units a hero can kill efficiently, and due to the variety of units which need to be killed, no one hero is better than the rest. Contrast with Warcraft's heroes, which all share the same damage type, but differ on the effects of their abilities. Players gain minerals for each enemy unit that they kill, and they can spend these on upgrades or minions. The upgrades improve the damage or armour of a certain class of unit; so a Goliath player will invest in Terran Vehicle Plating and Terran Vehicle Weapons. Each upgrade costs a little more than the last, and maximum life is fixed throughout the game. Alternatively, players can invest in hiring some Minions of their own. These include the usual Zealots, Firebats, and Marines/Ghosts, but also Tanks, non-hero Dragoons, and non-hero Zerglings. The upgrades that a player buys (such as Terran Vehicle Weapons) to boost their hero also apply to any relevant units they own, which means that a Goliath player's upgrades are indirectly improving any Tanks they buy later. For an additional fee, minions can be moved to the top-left of the map to promote them (from a basic Marine to a Marine with improved base stats, for example). This can only be done once per minion. Promoted units benefit from the same upgrades as the original. Despite no hero units using Terrain Infantry Armour/Weapons, players can invest in those upgrades for their hired guns. These units have relatively good scaling if upgraded fully, so this is potentially a worthwhile strategy for the Vulture, since it's the fastest hero at making money. The usual screenful of troops. There are a number of routes AoS didn't explore. The hero units don't have special abilities; I would have enjoyed using a Ghost with Cloak, Lockdown, and Nukes, or Tassadar with Psi-storm and Hallucination. There are no flying heroes either, which would certainly be a useful option considering how clogged the lanes can get! While this would be nothing new to any Starcraft player at the time, AoS does have quite clunky pathing due to the large numbers of units involved. There is also the inconvenience of having to manually buy each hero upgrade, which requires some control-group setup to do efficiently. In what appears to be inspired by early DotA, some later variants of Aeon of Strife allowed PvP matchups, introduced more hero units, and let players activate special abilities once they accumulated 100 kills. These variants allowed those still playing Starcraft to enjoy some of the more genre's recent innovations, but the maps weren't able to evolve much further due to limitations in Starcraft's editor. To whom is Aeon of Strife attributed? Most mention of the map online refers to "Aeon64" as the original developer, but almost every map file I could find was created by "Gunner_4_ever", or "Nick" from the download link below. I still don't have a conclusive answer. Yes, I checked more than four versions. Aeon of Strife has aged gracefully. The hero units remain balanced by their distinct roles, the sheer number of enemies keeps the fight exciting, and the game's simple premise of "survive" makes it easy to pick up and enjoy. It remains a lot of fun to experience the growth in power of a hero unit, just like its original player-base must have when playing it years ago. How did you make that huge screenshot? You mentioned that later PvP versions were inspired by DotA - are there still players on brood war playing custom games?